Transferring to Castleton as a junior, student Lacey Stever says she was unsure of what to expect from the small university with a big heart. “Right away I felt welcomed and have learned an immense amount in just the year and a half that I have been here. The faculty are extremely helpful and inviting, and have exceeded my expectations,” said Stever. Originally from Fairlee, Vermont, a lifelong love of sports and working with others led her to study Physical Education at Castleton. She is also pursuing a minor in School Health Education where she hopes to create a lifestyle of health and wellness for herself and others in her community. 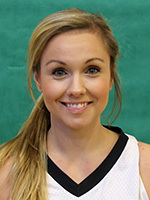 A member of the Castleton Women’s Basketball team her first year, multiple consecutive shoulder injuries forced her to end her athletics career early. But it never slowed her drive or leadership as she now serves as the Student Assistant Coach for the team, as well as Treasurer for the Physical Education and Health Education Club. “Castleton has increased my love for physical education and health and has shaped me to be the best educator and future leader in the community,” explained Stever. Thanks to guidance from her advisors Katy Culpo and Lisa Pleban, Stever hopes to pursue a second endorsement in Heath Education. She was involved with Girl’s on the Run at Castleton Elementary School over the past year and says the ability to create lesson plans and to implement them in a classroom to peers allowed her to increase teaching skills. Being a Vermont native Stever knew a smaller school atmosphere would be best for her university experience and Castleton gave her just that, between relationships developed with advisors and professor and the life-long friendships she found along the way.